Evaluation is a controversial and little-understood strategy of public governance, control, and decision making. As early as classical antiquity, scholars were summoned to court to counsel kings. Public policy and program evaluation is a recent addition to the great chain of attempts to use the brainpower of scholars and scientists to further the interests of the state. Evaluation scholars are asked to provide retrospective assessments of the implementation, output, and outcome of government measures in order to effect deeper understanding and well-grounded decisions on the part of those in charge of government operations. Evaluation is the process of distinguishing the worthwhile from the worthless, the precious from the useless; evaluation implies looking backward in order to be able to steer forward better. 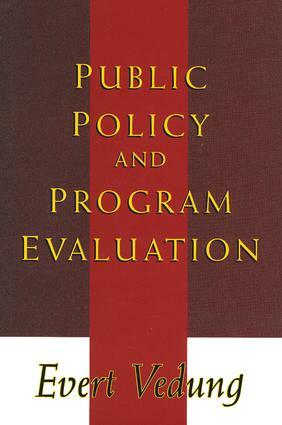 Written from a political science perspective, Public Policy and Program Evaluation provides an overview of the possibilities and limits of public sector evaluation. Evert Vedung examines evaluation as a mechanism for monitoring, systematizing, and grading government activities and their results so that public officials, in their future-oriented work, will be able to act as responsibly, creatively, and efficiently as possible. Topics discussed include: "Evaluation, Rationality, and Theories of Public Management"; "Models of Evaluation"; "Internal or External Evaluation"; "Impact Assessment as Tryout and Social Experimentation"; "Process Evaluation and Implementation Theory"; "The Eight-Problems Approach to Evaluation"; and "Uses and Users of Evaluation."